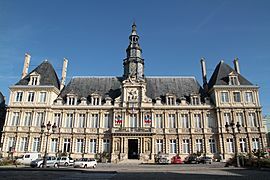 Reims is a commune in France, located in the Marne department in the Champagne-Ardenne region. Reims Cathedral (Cathédrale Notre-Dame de Reims) is famous by coronation of almost every king of France. The cathedral was destroyed by fire in 1914 (after an attack by the German army). German surrender of 7 May 1945 in Reims. (Top) – German officers sign unconditional surrender in Reims. (Bottom) – Allied force leaders at the signing. Reims Facts for Kids. Kiddle Encyclopedia.